Light acrylic "toss" gloves. The ones they sell for 99 cents at the pharmacy. Mittens - I find gloves leave my finger tips really cold. When it is in the 30s- I'll opt for tights or capris and light running jacket. Sometimes my toss gloves, since my hands get cold. When it is in the 20s- I'll opt for tights. A base layer and light running jacket. Usually go with a hat or ear band. Either Fleece Lined Gloves or my mittens. 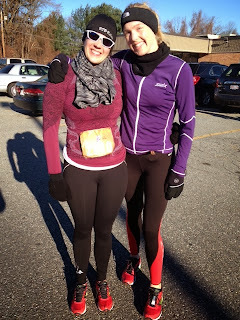 When it is sub 20- I'll opt for the lined tights. A base layer and fleece lined jacket. Hat and mittens. Sometimes I'll throw on a running scarf to give me another warm layer if the wind is whipping. I am thinking it is time to invest in some smart wool running socks. My regular run socks leave my toes cold for the first 30 min or so. I don't know if I heard this somewhere or made it up- but I always dress for 10 degrees warmer than it really is outside. That way I am cold when I start but okay when I am warmed up and running. Of course, all of this changes with precipitation and then depending on distance too. But these are some of my general Cold Weather Running ideas.